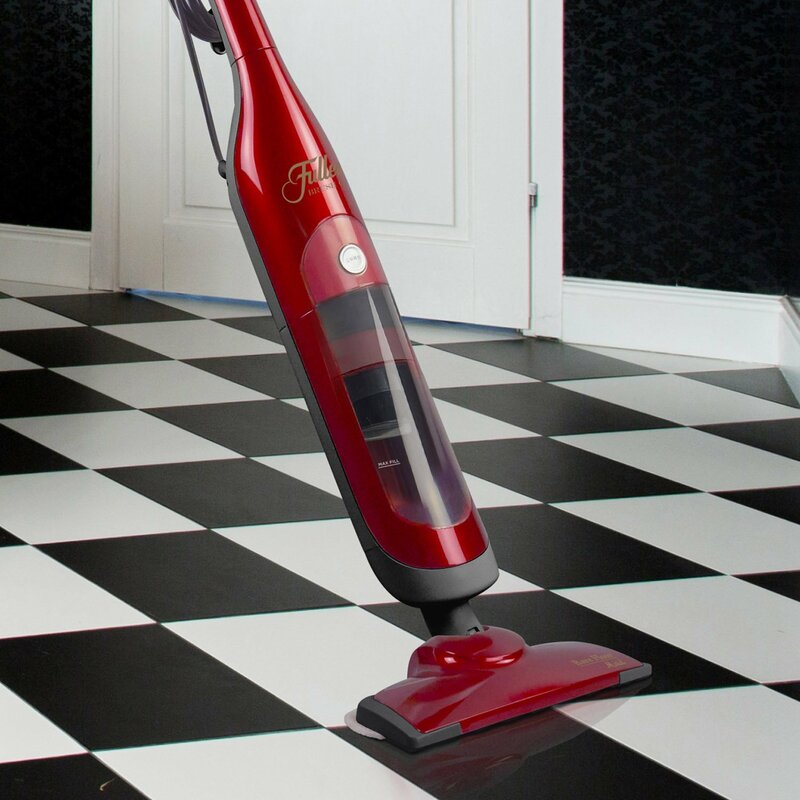 If you’re looking for a vacuum cleaner to help you with messy accidents or between routine cleanings, the Fuller Brush Bare Floor Maid is worth considering. The product includes both a vacuum and a dust mop in one unit you can use for quick pick-ups or pet hair messes. It glides over all the bare floors in one’s home leaving them polished thanks to the microfiber pad included. This pad can easily be removed and washed. Many users prefer a cordless unit when it comes to electric brooms. This model is not battery powered and thus features a 25-feet long cord, which might prove a bit uncomfortable. Yet this also means that you will be sure the unit is constantly powered and you won’t have to interrupt your cleaning to charge the vacuum. This convenient electric broom combines a vacuum and a mop so you can remove the dirt and polish the floor in one easy step. Its design featuring a swivel nozzle makes it easy to vacuum around table and bed legs, walls, and hard-to-reach areas. The squeegee it comes with will gently pull hair, dust, and dirt off the floor. If your place is also home to furry friends, you will be able to keep it clean using the Bare Floor Maid as the vacuum will easily pick up crumbs and pet hair. Since its design allows the user to reach even tight places, you will make sure to remove such dirt from tight areas. One of the features that make this model stand out is the microfiber polishing pad included. This will complete and simplify your cleaning process by polishing the areas you vacuum. This way, you won’t have to vacuum and then use another mop or pad to polish the floor. You will take care of two steps with just one product and thus make sure you don’t leave any dirt behind but only clean and buffed floors. Moreover, the microfiber pad can be removed with ease and washed for your next cleaning session. 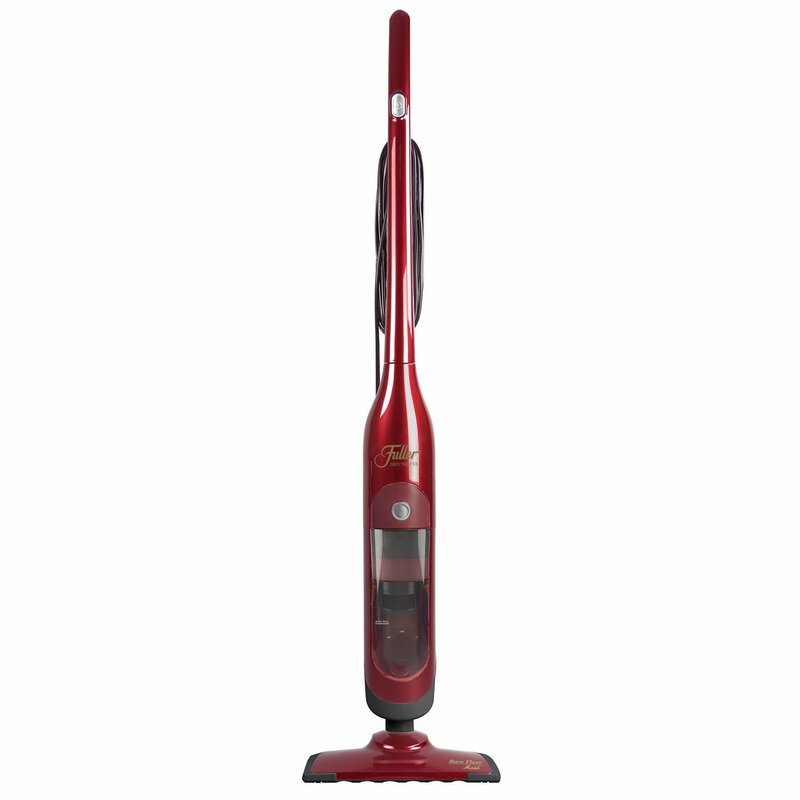 The vacuum runs on a 5 AMP motor and features a 25-feet long cord. Even if it does not offer the same freedom as a cordless unit, the product can be used until your cleaning process is complete because you won’t be needed to stop your cleaning in order to charge the battery. Plus, the length of the cord will enable you to use the vacuum on a large area and far from your power outlet. It comes with a quick release cord hook to speed up the process of cleaning. The bottom plate is made of high-impact polycarbonate and the item weighs 7.1 pounds, which means you can maneuver it with ease.